“The Fall of Man,” by Hans Sebald Behan, represents Adam and Eve's expulsion from the Garden of Eden. Fortean Picture Library. According to Genesis, the first book of the Jewish and Christian Bible, the first man and woman were created on the sixth day of Creation, "in the image of God." Two accounts are given. 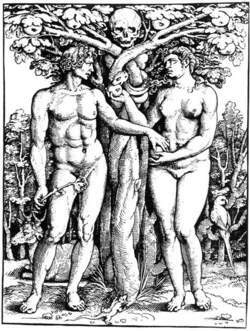 In Genesis 1, "male and female" were created together (see Lilith). In Genesis 2, the first man was created, and when "God saw that it was not good that the man should be alone," a "helper fit for him" was created from one of the man's ribs. Because the man was created "from the dust of the ground" (Adamah, in Hebrew), he was called "Adam." The name "Eve" comes from the Hebrew Havvah, meaning "life-bearer." Their home is said to be in the garden called Eden, in the region where the Tigris and Euphrates flowed, along with two other now-unidentifiable rivers. Their life was said to be innocence itself, existing in total harmony with each other and their environment, with no need for clothes or covering, and with God, who "walked in the garden in the cool of the evening." All this changed in Genesis 3. It was then that temptation, in the form of the "forbidden fruit," led to sin and the fall of the human race. A serpent, identified much later by Christians as "that old serpent, the Devil and Satan" (Revelation 20), appeared to Eve and tempted her to eat the fruit of the one forbidden tree, the tree of the knowledge of good and evil. Succumbing to three temptations—of the eye ("it was a delight to the eye"), the flesh (it was "good for food"), and pride (it was "to be desired to make one wise")—she ate of the fruit and gave some to Adam, who joined her in breaking God's command. When their act was discovered, punishment followed. Eve was to bring forth children in pain and her "desire [was] to be for her husband, [who would] rule over [her]." Adam, because he "listened to the voice of [his] wife," was destined to work in the fields and henceforth earn his daily bread "by the sweat of [his] brow." Children were born to them. After Cain, the firstborn, killed his brother Abel and departed to build a city, their third son, Seth, was born. Seth carried on the lineage of the rest of the human race through his descendant, Noah. Although Adam was said in Genesis 5:4 to have fathered "other sons and daughters," they are not named. There are at least three ways to view the story of Adam and Eve. 1. As a historical account of what actually happened. Since the events occurred at the beginning of Creation, it is impossible either to prove or disprove this view. 2. As an early origin myth attempting to explain, among others things, how the human race came to exist and why a "good" God could have created a "good" creation that seems to possess "bad" qualities. 3. As a metaphor expressing the oral memory of historical evolution. In other words, our ancestors did once walk the forest, eating what the trees offered, until they learned to grow crops "by the sweat of their brow." The "good old days" of gathering in the forest are pictured as a "Garden of Eden," better than the drudgery of the tasks of plowing and weeding. However the story is read, it has become a source of rich spiritual and philosophical exploration. Many different religious discussions have centered on treasures to be mined from this vein. Mary Baker Eddy, the founder of Christian Science, sees in the name Adam a metaphor for "a dam," or an obstruction. In this case the dam does not restrict the course of water, but of thought. In other words, our original male parent was the first to lose, or block, the purity of a perfect, "good" way of viewing the world. Since then, we are all doomed to see the illusion of death and sickness rather than the reality of life and wholeness. Daniel Quinn, in novels exploring present-day life and how it came to be this way, sees in the story of Adam and Eve—and later, Cain and Abel—a retelling of what actually occurred during the agricultural revolution. Cain, the agriculturalist, killed Abel, the nomadic shepherd, and went out to build a city. Historically, this progression took place when humans developed a stable food supply. "Civilization," including the building of cities and the invention of writing, marked the beginning of what we now call history. In other words, the story of Adam and Eve is a myth describing the hinge between prehistory and history. Because the Bible places the story six to eight thousand years ago, the same date historians use to mark the first agricultural revolution, Quinn makes a compelling case (see Agricultural Revolution). Joseph Campbell saw in the story another example of the universal myth he called "the one forbidden thing," retold in almost every culture to deal with the "problem" of evil, or why bad things happen to good people (see Evil). Christian theologians ever since the apostle Paul have used Genesis 3 to explain the need for the sacrifice of the Son of God. When Adam and Eve were cast out of the garden, "an angel with a flaming sword" guarded the entrance. This was the angel of death, blocking the way back to Eden. Union with God is impossible without death because, in the words of Saint Paul, "the wages of sin is death" (Romans 6:23). Being descendants of Adam and Eve, all humans have inherited their "original sin." An old New England spelling primer, dating back to 1691, put it simply: "In Adam's fall, we sinned all." Christians thus see Jesus as "the second Adam," who came to undo or atone for the sin of the first Adam. In 1 Corinthians Paul writes, "In Adam we all die... but in Christ, the second Adam, we shall all be made alive." In the Qur'an, Muslims read that after Adam was created the angels were told to bow down to him. Iblis, the Satan figure, "refused and was haughty: he was one of those who rejected Faith" (2:33-37). Thus Iblis was cast into hell not because he hated God, but rather because he loved God too much to worship another created being. Jeffrey S Gonzalez, Sabrina A Esbitt, Havah E Schneider, et al. Lee portrays Havah as a fleshand- blood woman struggling to recover her former joyful existence and fighting for survival after being cast from the garden. Havah is an invitational word, usually translated as "come. and his passengers, Havah Eisenmann, 24, of Republic, Wash.
Arabs and Palestinians in Israeli school textbooks. changing the perception of the "other"